To the man who was hired by the City of Covington to mow the lawn next door: I'm sorry. The Day lilies we planted two years were so gorgeous, the soil that we tilled and fertilized so productive, the beauties that have been painstakingly growing in our yard have simply multiplied and thrived. I have been watering and fertilizing them in anticipation of carefully splitting the bulbs and replanting them in carefully chosen locations throughout our small neighborhood of Seminary Square. Perhaps you remember.... you were here today. I'm sorry I missed you. I am really REALLY sorry I missed you. You see, my husband and I carefully dug up over 200 bulbs this week. We planted about 90 of them in the back yard of our next door neighbor's house; a house that will soon be remodeled by the Covington Center for Great Neighborhoods, and then hopefully purchased by a family who loves gardening, and yes, even daylilies. It was a 'pre-gift'. 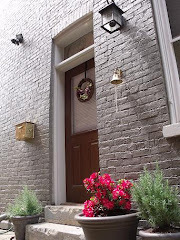 A way to let the new neighbors, whomever they might be, know that we're glad to have them in our neighborhood. We bashfully thought it might be a way to encourage folks to take an interest in our little developing chunk of Covington. That's why we carefully replanted the lilies in their yard, heaving many 5 gallon buckets of fertilized water over to make sure that they could rough out the transplant, and maybe (just maybe) bloom in a month or so. I know they're hardy, because this is the time of year we transplanted them into OUR garden two years ago, and they bloomed for weeks and weeks right out of the gate. The last two days I'd been checking out one of our windows and looking over at them like a proud mama... but I digress.... I wanted you to know that I'm sorry. I looked out the window... sometime after you had left the scene. And you know what? I'm sorry you left before I could put my left foot up your backend for what you did, you horrible excuse for a "lawn care" employee. I swear if you showed back up right now, I'd be in serious trouble for taking a shovel and smacking some sense into that fart-sniffing jerkmuppet tadpole brain (do I assume too much.... perhaps) of yours. What the heck were you thinking? Or is THAT presuming too much as well? What took me three or more hours of careful thought and planning, you mauled in seconds, you idiot dirt jockey. Seriously, the freshly, carefully turned soil didn't give you a clue? What? The tall healthy plants reminded you that you hate your job, your life, and the people you meet everyday? You should know that I really don't like you. I don't like lazy, stupid people in general, but your willful idiocy just tops the cake. You are the Pièce de résistance of idiot savants. Without the redeeming 'savant-y' part. I'd love to find out who you are and ask the City of Covington to terminate your employment contract. There are plenty of decent folk who need a job and can tell the difference between a 1" blade of grass, and a 2 foot tall day lilly flower bed. And by the way--- the grass was already short-- what the heck were you mowing over there?!? Personally, I'd rather someone else have your job. Obviously, you don't want it.My rationale is that anyone that stupid is bound to do something far dumber, and dangerous, and perhaps should not be in a position to handle flammable liquids. Not as long as I have a match nearby, anyway. The wildlife list, that is. We are in the city, just a few blocks from the highway. Just 10 blocks and a river (walking distance) from Mike Brown Stadium. Yet we get a surprising variety of creatures in our little postage stamp of a back yard. We've posted our list before, and today I need to add a few birds to the list. The first, is a first for me, too. 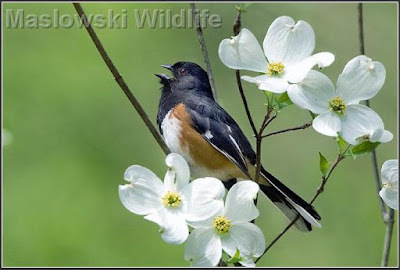 Today I saw an Eastern Towhee (picture above) for the first time.